Our Biggest Sale in History! We are so excited this week because there are so many amazing things happening! The first is one of our favorite days of the year – Thanksgiving! No matter how you celebrate, whether with a huge family extravaganza or a quiet get together with close friends, we hope your Thanksgiving Day is filled with lots of love and delicious (and healthy) food. Then there’s the great American tradition called Black Friday (which has actually starts happening for some people on Thursday night after Thanksgiving dinner). If you’re bargain shoppers like we are, you don’t want to miss the Black Friday sales. And finally, there is the newish online shopping tradition called Cyber Monday – this second great reason to shop till you drop this week, was started back in 2005 and has quickly become one of the biggest online shopping days of the year. The amazing thing is all three of these fantastic events are happening in the next 7 days! Now, in last weeks newsletter we shared with you some of our favorite Thanksgiving recipes – and we are looking forward to hearing from you with your families rave reviews about these deliciously healthy recipes. However, this week, in the great tradition of saving money, we are going to have the biggest storewide sale in Calton Nutrition history! We are slashing our prices by up to 75%!!!!! You read that right up to 75% – here are just a few examples of the amazing deals you are going to get. Oh, and there’s even better news – you don’t have to wait until Friday or Monday to get these deals – our Black Friday/Cyber Monday sales are starting RIGHT NOW!!!! These are ORGANIC essential oils that sell for as much as $32.57 per 15ml bottle* by other retailers (* Young Living Basil) If you have friends or family members who use high quality essential oils let them know about this amazing sale. Again, this is not some no-name, non-tested, pesticide-laden plant protein. This is our USDA organic, sprouted rice and pea protein that has been cold processed, non-irradiated, and non-denatured and is free of GMOs ingredients like soy, corn and wheat as well as from potentially harmful pesticides, heavy metals, artificial colors, flavors, sweeteners, and of course sugar. HINT: If you use plant protein you do NOT want to miss this sale – if you know someone who uses plant protein TELL THEM about this sale. We didn’t forget about you whey users out there. Again, this is our high quality, pasture raised, USDA certified organic, cold processed, non-denatured whey protein concentrate free of GMOs ingredients like soy, corn and wheat as well as chemicals, artificial colors, sweeteners and sugar. 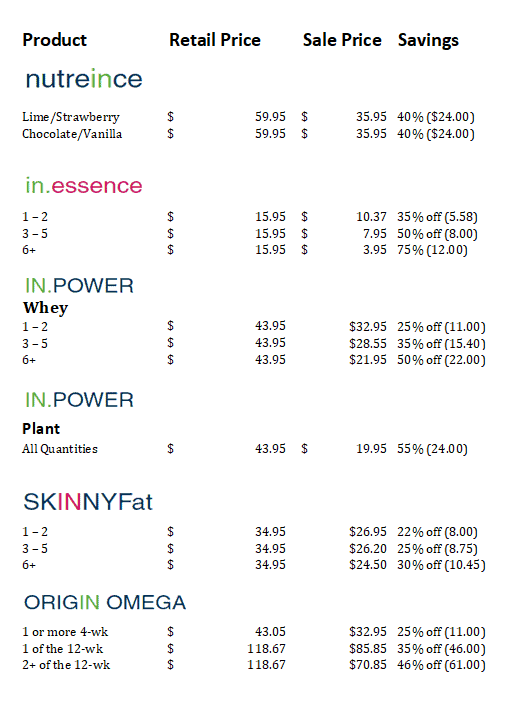 HINT: This is our lowest price we have ever offered our IN.POWER Organic Protein. If you use whey protein you do NOT want to miss this sale – if you know someone who uses whey protein TELL THEM about this sale. Don’t miss out on this opportunity to get nutreince (Lime/Strawberry and Vanilla/Chocolate ONLY) for $35.95 per box! You do NOT have to purchase 6 boxes to get this deal – you can purchase just one box! HINT: This is a great time to try nutreince! Don’t miss out on this amazing kitchen oil that not only is free of inflammation causing omega-6, but also increases metabolism, is easy to digest, and provides natural ketones for energy! This is the only fish oil on the market that uses patented Anti-Competition Technology to separate EPA and DHA to eliminate binding site competition. Origin also delivers 710 mg of EPA and 710 mg of DHA in each daily dose. HINT: Do yourself a favor and compare Origin Omega to your current fish oil. THIS IS THE BIGGEST SALE WE HAVE EVER HAD! Don’t miss out! Stock up now and save big! We want to wish you all a Happy Thanksgiving. We hope you enjoy our Calton Nutrition version of Black Friday and Cyber Monday – remember our sale starts NOW! These sale prices will be the store prices for this period. There is no need for a coupon code. They are not good with any other offers, coupons or promotions and cannot be applied to previously placed orders. There are minimum orders to reach the highest levels of discounts but no limits to how many you can buy at these great prices. This offer ends Nov 27th at midnight .